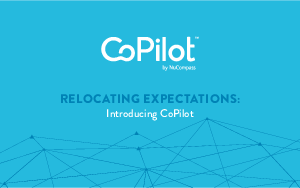 Offers > NuCompass > Relocations Can Be Easier. CoPilot Can Help. Relocate Your Expectations. Let’s face it: Relocation is expensive. There are more than 250,000 employees who relocate every year in the U.S. and it can cost tens of thousands of dollars. Sometimes finding the best talent requires looking outside your own city. With a shortage of great talent, relocation is not going away anytime soon. Download our e-book today and learn about our revolutionary and award-winning platform that puts you and your organization in the driver’s seat, with transparent, affordable pricing.